Planning merchandise for a store is a cumbersome task for a retailer. If you're having a hiccup planning the right merchandise mix, then here are few key considerations which will ease this process for you. There are many aspects a retailer has to see while choosing on merchandise before putting it up on a shelf for sale. To ease the tension, there are key factors involved which are termed as the right merchandise mix which determine the conversion quotient with regard to sales in a store. While considering the compatibility with a product line in mind, a retailer must consider two aspects. First, the product should not be a substitute to an already fame acclaimed product since that not only gives encouragement to comparisons, be it price or design but also questions the innovation and uniqueness of the product. Second would be that a product should mark its presence through complementing itself in the market where it needs to be sold, for instance a washing machine may increase the sale of detergent powders however lowering the price of detergent powders would not help increase the sale of washing machines. So, therefore, when putting up a product for sale, its affordability and utility should complement its highlighted features. Along with pricing or designing the physical attributes mean a lot when considered in matters of merchandise production. The primary concern is whether the merchandise needs to be produced in bulk, whether it requires a standardisation mark (for instance, electronics do require one) and which selling methods would the retailer need to adopt, direct selling or indirect selling. 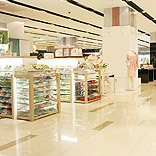 It is necessary for a retailer to strategise where he sells the product and how he sells it. The retailer needs to keep in mind that the merchandise he may produce should always be better in quality, price, availability and design in comparison with his competitors. As that not only increases his market presence and sales but also builds brand loyalty. He may take up licenses from other brands for his product in order to create exclusivity and uniqueness of the merchandise. A retailer has to keep in mind that a product may last only a few seasons, a product can have a classic model however newer designs and features is what the consumer looks forward to. The retailer sees potential in making a clientele and keeping it for good, and this may happen only when the merchandise has potential to keep the sales going. The retailer needs to keep in mind that the merchandise to be produced must depend on the market trends as to what the demand is for, be it iPods or e-book readers. How well the merchandise sells depends on the usage and buying needs of targeted consumers. The retailer also needs to research on the target consumer’s activities, lifestyle, interests and opinions while finalising the merchandise for his outlet. Since a consumer relates to what his life includes in it, an artist might fancy art stores or art accessories. In the same manner a child would run up to a toy store than a furniture shop. The product line should be on the acceptance of the target buyers from a retailer’s perspective. A product can be known to a consumer when it is highlighted through publicity, be it advertising or trade shows, the product should relate to the consumer in the first attempt. These aspects are important for every retailer as one may know how much effort and intelligence is required to produce merchandise and it takes double the effort and higher credibility to sustain its market value.